According to a forum on the subject of things to do in winter, it's now time to put on the pud, eat and sit around inside. As the year drifts towards winter, many residents of the summer city are suddenly at a loss over what to do on the weekends. There are moans and groans that Sydney isn't cut out for winter activities. 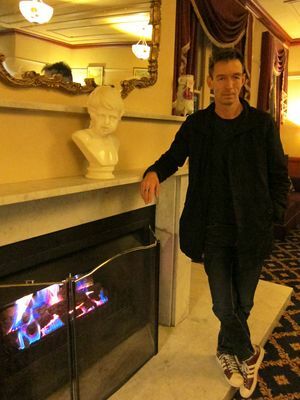 Take heart Sydneysiders - there's no need to spend winter on the lounge. Winter can be a genuinely fun time. After all, it's the only time you can wear a trench coat, mittens and a scarf. It's also the best season for snuggling and intimate pow-wow's over hot chocolate or wine with your friends. For those who have exhausted the pizza and DVD night, I have ferreted out a whole bunch of options to get you out of the house. You won't find obvious suggestions such as going to the movies and eating out on this list. You can think of that yourself. Nope, this is a genuine list of alternatives to eating out, the movies and hanging out at home. Okay, so there are thousands of restaurants in Sydney and multiple cinema's, but, this movie and vegetarian 'all you can eat' combo is something totally unique. According to TNT Magazine: "Like they say - if you're in LA. go to Disneyland. If you're in Sydney, go to Govindas." 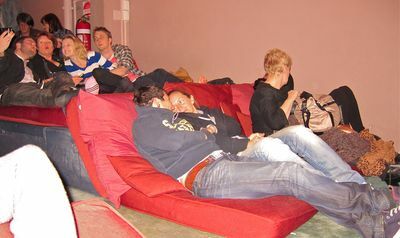 For $13.90, experience Govinda's intimate movie room and watch a recent release movie lying down. Grab the vegetarian buffet ($19.80) as well and the cost of the movie ticket reduces to $10. If you hate the cold, you're going to love the fact that you can go straight from dinner to the movie. Govinda's is located in Darlinghurst (Kings Cross side). Do book: both the movie and the buffet are insanely popular and people start to queue for the movie about half an hour before it commences. See the Govinda's website for more info and a list of movies. Comedy venues about town include The Comedy Store, the Friend in Hand pub at Glebe, The Roxbury Hotel, The Marble Bar, the Star Bar and The Laugh Garage. This list is by no means extensive. Why be the audience? There are many comedy competitions you can partake in on 'open mic' events. Stay warm, feed the gut some excellent Lebanese, Turkish, Egyptian, Greek or Persian fare and be entertained by exotic belly-dancers. For a more authentic experience, search out a restaurant with cushions. Makes for a great night out with friends, atmosphere, music (can be overly loud) and might inspire you to get your gut into gear. Top venues for restaurants with belly dancers include Almustafa in Glebe, Abdul's and Habibi's in Surry Hills, Sahra by the River and Sahara Turkish restaurant, both in Parramatta. Pubs and clubs in your local area are usually the hosts for this. Put together a team of friends, have a meal together or drinks. A great way to get some cerebral exercise, enjoy team spirit and the perks (food, wine, heating and more wine) that go with an indoor pub-style venue. Note: sobriety is recommended if you want to win the game. This isn't as mystical as it sounds, but refers to the imbibing of spirits (or herbal teas, water, juice, soft-drink) while sitting around the log fire of some cosy establishment with your friend(s), lover(s) or even by oneself. Simple as it sounds, there's something primeval and innately comforting about this ritual. Harks back to caveman days and bonding around the camp-fire. See the list on bars below, however, log-fires can also be found in restaurants, café's or your own backyard. 'The show must go on' – so goes the punch-line. 'Come winter, hail, rain or snow' is another. Well, what better season to go to a show than winter? Check out what's on at the State Theatre, the Opera House, the Capitol Theatre, Sydney Theatre, Theatre Royal, the Allphones Arena (formerly Ace Arena) at Sydney Olympic Park, Belvoir Street Theatre, or King Street Theatre. Your local community theatre also provides great options, closer to home, possibly for a cheaper price. For something with a wintry theme, see the Nutcracker on Ice at the Capitol Theatre or for kids, Disney on Ice (one week in July) at the Allphones Area at Sydney Olympic Park. These places suffer from an association with alcohol. However, there is nothing to stop you from stopping at one pina colada, or from having plain old water. Cocktail Bars are great places to hang out, get cosy, catch-up with friends and chat while staying warm. Some excellent Sydney bars include Bacco (Chifley Plaza, 3 Chifley Square), The Cargo Lounge (King Street Wharf) and the Icebergs (views over Bondi Beach), but I'm sure you have your favourite. For extra cosiness factor, fireplaces and possible board games check out The Lord Dudley Hotel (English style country pub atmosphere at 236 Jersey Rd Woollahra), The Victoria Room (colonial style bar upstairs in Victoria St, Darlinghurst) Madame Fling Flong (169 King St, Newtown), and the Eastern at Bondi Junction. The Victoria Rooms host complimentary entertainment - Performance Carnival - every Sundays from 6pm. So far this list has been slim on activity - yours! For the sportier inclined, indoor sports centres provide opportunity to do those things we normally associate with outdoors – namely, physical activity. A whole host of sports can be played indoors, including tennis, netball, volleyball, soccer and rock climbing. Indoor archery is a specific winter sport. For more information, scout out the local sports centres, ask about, or do your own google search. Heated pools are there for a reason. It's important to retain your fitness during winter without freezing to death. Check out the heated pool, five spa's, sauna and steam room at the Acquatic Centre at Sydney Olympic Park. It also has a terrific water playground for kids, kept heated to 26 degrees Celsius all year round. Okay, so I cheated here. Ice-skating venues aren't warm, but you will warm up eventually, and winter is the season for them, after all. Some venues for ice-skating include Sydney Ice Arena at Baulkham Hills and Macquarie Ice Rink at North Ryde. Macquarie Ice Rink have an ice disco on Friday and Saturday nights. 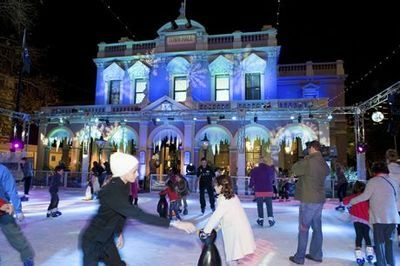 This winter (during the July school holidays) Church St Mall in Parramatta will host an outdoor ice rink as part of activities for a new festival called Winterlight. Skating sessions for Winterlight need to be pre-booked. Just a thought. Some people like bowling, some don't. This is hosted by those cold regions – the Blue Mountains and Southern Highlands. Christmas in July (also known as Yulefest) refers to celebrations held in the Southern Hemisphere that try to evoke the atmosphere and charm of traditional white Christmas's in the Northern Hemisphere. This generally means the appearance of the fat bearded man in red and that carol singing, Christmas themed decorations, roast dinners, log fires, port and plum pudding will be on the cards. These 'cold places' are also fully equipped with log fires, cute eateries, winter ambience, scenery and romantic guest-houses to wile away the winter in. Check out some venues and packages at the Yulefest website. What better way to get warm and pampered. Day Spa's with their emphasis on massages, body wraps, heated spa's and various body pampering treats are great places for relaxing and unwinding the body and mind from those ongoing stresses that plague us in all seasons of the year. Hot stone massages are particularly popular in winter, You will find day spa's in most places, but particularly dotted about the tourist traps. Sample wines, cheeses, olives and olive oil, preferably with some crusty bread. Move on and do it all again. And again. Wine tours are popular in winter. Best area for wine tours include Bathurst and Mudgee, the Hawkesbury and of course, the Hunter Valley. Museums can be fascinating places to browse about – if that's your thing. Check out the latest at the Powerhouse Museum or The Australian Museum. The Australian Museum is currently hosting a Deep Ocean exhibition. Winter is the season for getting creative. Why not get some inspiration and indoor warmth at the gallery. Check out your local galleries or the Art Gallery of NSW. Go to your local and enjoy the talent on offer. Alternatively, check out the gig guide for big name bands at one of the big venues like the Entertainment Centre, the Enmore, the Metro, the Hordern Pavilion or the Sandringham. The Basement in Sydney hosts regular jazz gigs and serves restaurant food. Book a night tour in which you can view the sky (weather permitting) through the telescopes, learn about the universe and watch the 3-D space theatre, as well as look at historic astronomy and meteorological tools. For prices and details see the Sydney Observatory website. Okay, so they're not the same thing, but you get my drift. Plus, you will often find them on offer at the same centre. For the spiritual minded, this is the ideal place to warm the body and soul. Yoga offers gentle, though still vigorous physical exercise and a place to meet like-minded people, while meditation will work that stress out of your brain. You can find yoga and meditation through local community and learning centres, advertised in the paper and run by spiritual groups. Great list, lots of good ideas!